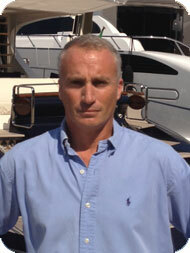 Yacht Broker Mark Meyer : Atlantic Yacht & Ship, Inc.
Mark started to get a taste for boats at the early age of 4. His Father a Navy Pilot stationed in Italy was an avid sailor and taught him how to sail and maintain boats. Mark spent most of his summers on a LeCompte Fastnet 45, designed by Bill Luders, cruising the Med with his family. After retiring from the Navy his father became one of the initial investors in the development of the first private marina ever built in Italy. Mark spent all his summers working for his father on boats and this is where he acquired his passion for yachting. After graduating from college with a degree in Finance, Mark worked in New York City as stockbroker for 12 years and in Florida in real estate development and brokerage until 2003. In 2004 Mark joined Baia an Italian power boat builder and became the managing director of U.S. operations where he managed all the sales and service aspects of the company. In 2010, Mark joined Atlantic Yacht and Ship and in 2011 established a sales office in Italy catering to his European and U.S. clients. Through the years Mark has cruised extensively throughout the Mediterranean and Caribbean. Mark currently works and lives between the U.S. and Italy. He strives to please his clients with integrity and his business background, experience, and multilingual capacity has given him an edge to successfully represent his clients with the purchase or sale of their yacht.